Explore the concepts of kinetic and potential energy, as well as velocity, by creating marble rollercoasters. Foam pipe tubing or pool noodles. Factor 3 tubes/noodles per child as a minimum. Cut at least half of the foam pipe tubing/pool noodles lengthwise to make tracks. Leave some uncut to form tunnels for the coasters. 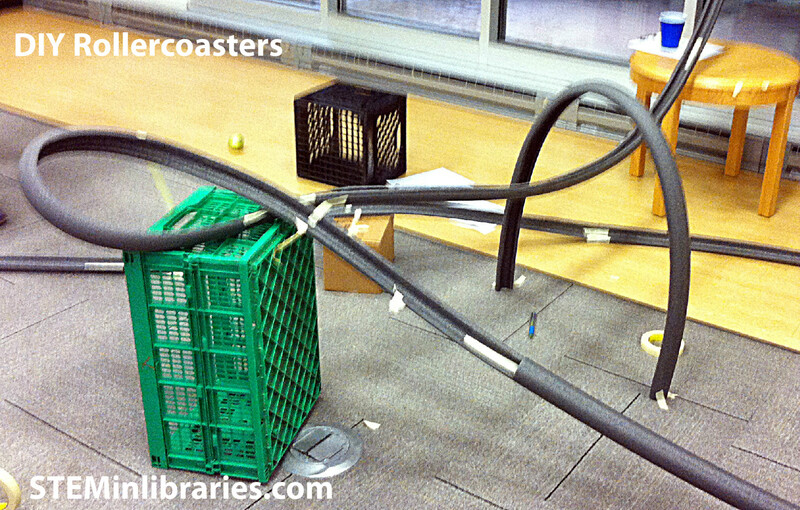 Using either foam pipe tubing or pool noodles, create roller coaster tracks for marbles to roll on. Tape tubes together with masking tape, and use boxes to create hills for the track to run on. Place a cup at the end of the track to catch the marble when the ride ends. Science Buddies: Roller Coaster Marbles: How Much Height to Loop the Loop? This was a highly successful program, and extremely popular with the participants as it was. The only changes we might make to the program would be to include more boxes to use as ramps and obstacles and increase the length of time for the program. Even at 90 minutes long, we had kids staying late to try “just one more thing” with their coaster. This program would work well for a younger audience, grades 1-3, as is. To adapt for a teen audience, add complicated obstacles and introduce the concept of track changes—inserting paper card stock ramps and track elements to see how the dynamics of the roller coaster changes. I’m going to buy my kids some foam tubes and try this. We’ve got plenty of marbles but marble sets never seem to be tall enough. Just tried this program out for grade 3-6 at my library. It was a weekday evening time (6:30-7:30). We had a good mix of kids that worked well together either in pairs or larger groups (4). They liked telling the group what they knew about gravity, friction, etc… They were building and tinkering with these tubes and half-tubes for the entire time and never a dull moment! Also seemed to bring in a few kids that otherwise don’t come to library programs often.